Fig. 1. Ritual Bronze (pu), Zhou dynasty (1046-256 BCE). Woodcut. Qinding Xiqing gujian, juan 29, p. 44. Image in the Public Domain. The majority of Bertin’s collection was made up of works on paper, of which the largest category by subject was images of Chinese vases and other objects. Whether in woodcuts or drawings, they were depicted floating without reference to a context or setting in the void of blank sheets of paper. The largest group of these images is comprised of 1,529 woodcuts illustrating ritual bronzes enshrined in the monumental Qinding Xiqing gujian, or “Imperially Commissioned Mirror of Antiquities of the Xiqing Hall” (1749-1755), a rare copy of which was sent to Bertin late in 1767 (Fig. 1). 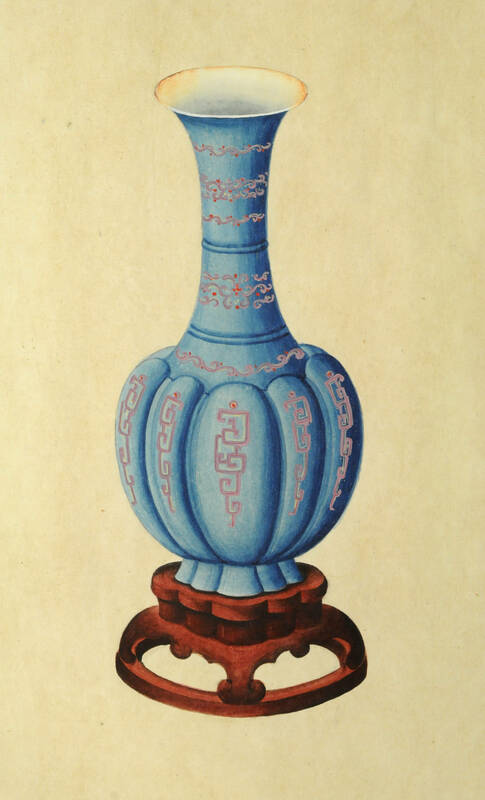 During the 1770s, he received several groups of what we now identify as watercolor drawings mostly of Chinese vases but also of other objects, which were executed by draftsmen intimately familiar with a wide range of archaic, classic and contemporary forms (including export models) as well as specific modes of presentation rooted in contemporary court practices. 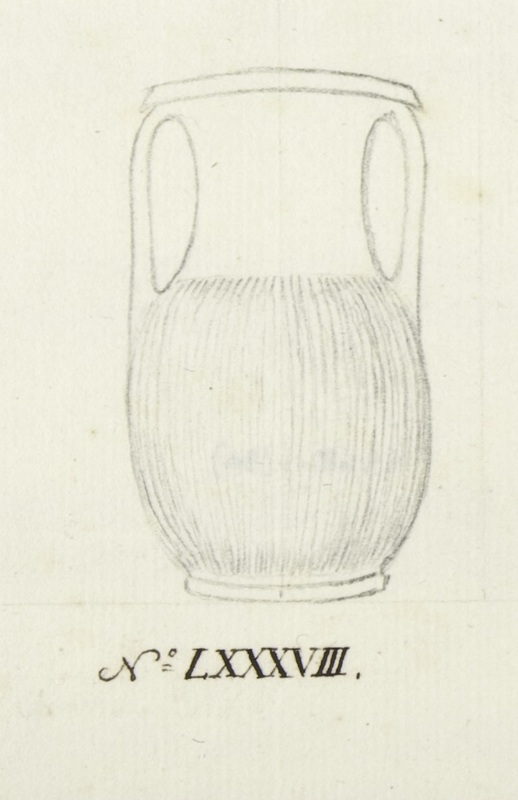 These drawings were variously described in the Bertin correspondence as “vingt quatre dessins de vases,” “vases anciens dépeints,” “[une] collection de vases chinois, de différentes formes: deux cent deux feuilles,” and “une centaine de peintures de vases Chinois.” Until recently, scholars knew of only 95 sheets. 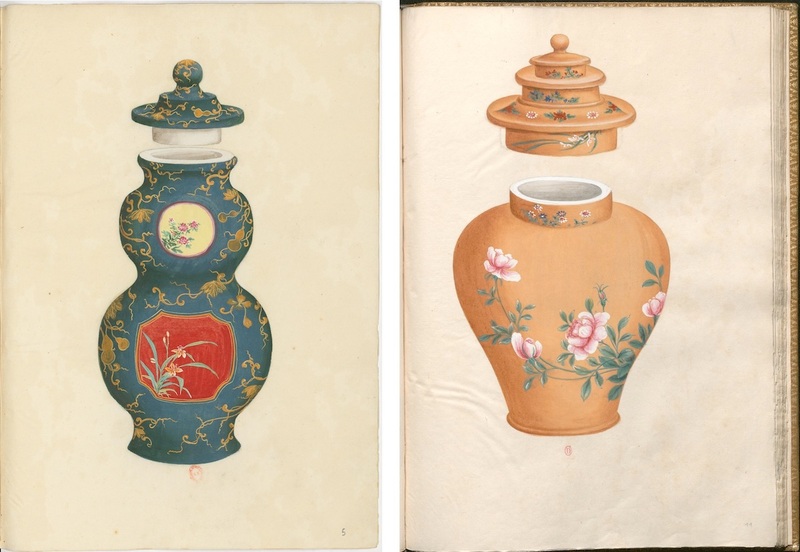 If nothing else, this essay celebrates the felicitous recovery of an additional 250 drawings of “vases Chinois” in Henri Bertin’s collection. The range of material Bertin received from China can be broken down into “original” works shipped in their Chinese bindings and suites or recueils of images specially assembled at his behest but bound into albums in France. The minister’s Jesuit agents, who were well positioned within the Qing court to address his myriad intellectual interests, selected the specific subject areas and furnished explanatory texts from which annotations were derived. In the aftermath of the suppression of their order by Rome in 1773, they became fully dependent upon him for basic financial support, but also found in Bertin an avid student of China and its civilization. His chief tutor in this respect was Father Joseph Amiot (1718-1793), who arrived in China in 1750, and who by the 1770s had become fluent in both Mandarin and Manchu and thereby deeply knowledgeable about ancient China and Qing court culture. LEFT: Fig. 2. Estampes Album. Vase Chinois (pu), China, c. 1770-1780. Ink and colors on paper, 36.5 x 35.5 cm. Vases anciens, et diverses Porcelaines de Chine, pl. 31. Paris, Bibliothèque nationale de France, Département des Estampes OE-42-PET FOL. ©BnF. RIGHT: Fig. 3. Vershbow Album. 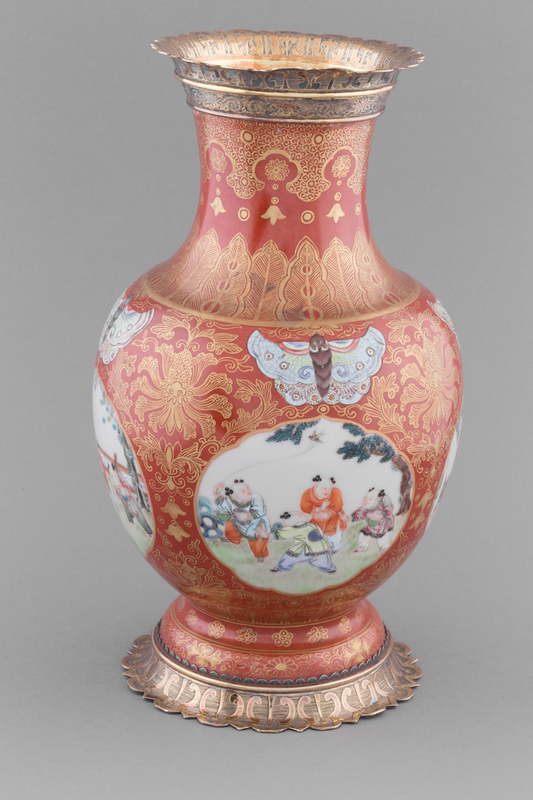 Vase Chinois (doucai-type covered jar), China, c. 1770-1780. Ink and colors on paper, 24.8 x 24.9 cm. Recueil de Vases Antiques. et Piéces, tirés des Cabinets Chinois de l’Empereur Kien-Long, p. 58. Provenance: Arthur Vershbow (1922-2012). Private Collection. Photo: Richard P. Goodbody NYC. Fig. 4.Oberlin Album. Vase Chinois (incised moon flask), China, c. 1770-1780. Ink and colors on paper, 44.5 x 27.9 cm. Vases Chinois, pl. 61. Provenance: William Beckford (1760-1844) and Mary A. Ainsworth (1867-1950), Oberlin College, Class of 1889. Oberlin College, Clarence Ward Art Library, Shelf mark NK4655 V38. No known copyright. As for “original” items, in addition to the aforementioned Qinding Xiqing gujian Bertin received exceptional works such as those relating to Qing imperial ritual and ideology that were otherwise not obtainable commercially. These included the Huanchao liqi tushi (1766), a woodcut inventory of ceremonial objects employed at the court, as well as an imperial edition of the Yuzhi shengjing fu or Elegy to the City of Moukden, an elegiac paean to the ancestral locus of the Manchu composed in 1743 by the Qianlong emperor (r.1735-1795) himself. Amiot sent the latter text to the Bibliothèque Royale and published a transcription and translation in Paris in 1770. 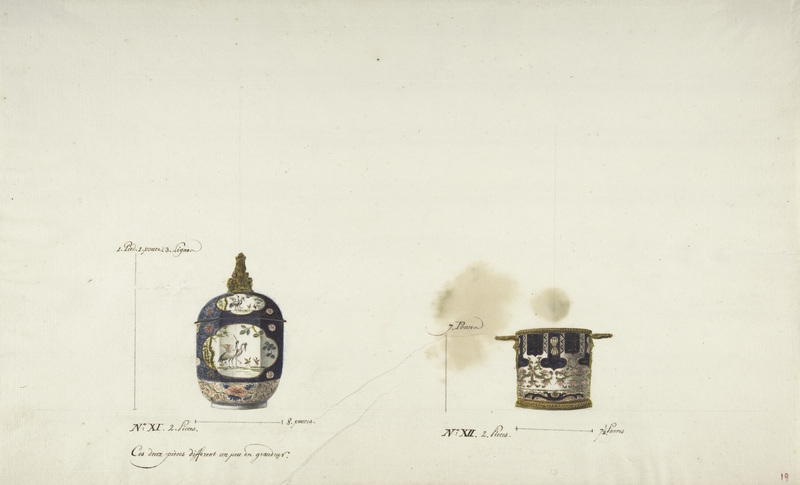 As for suites or recueils of images the Jesuits assembled expressly to address Bertin’s special interests, the documentary evidence unearthed thus far and summarized above enumerates 326 watercolor drawings of vases and other objects they sent to France. To date, 345 have actually been identified and survive within five discrete, historically compiled albums. Two of these comprising 171 sheets in total were made during Bertin’s lifetime (Figs. 2 and 3). The other 174 sheets were subsequently bound in the nineteenth century (Figs. 4, 5 and 6). An initial examination of the original bindings of these albums will not only reveal how Bertin engaged with the drawings at the time, but also presage how later connoisseurs, notably William Beckford (1760-1844), received them. While the nineteenth-century albums will be discussed in detail below, suffice it to mention here that one of those acquired by Beckford was later given to Oberlin College (hereafter “Oberlin Album”). 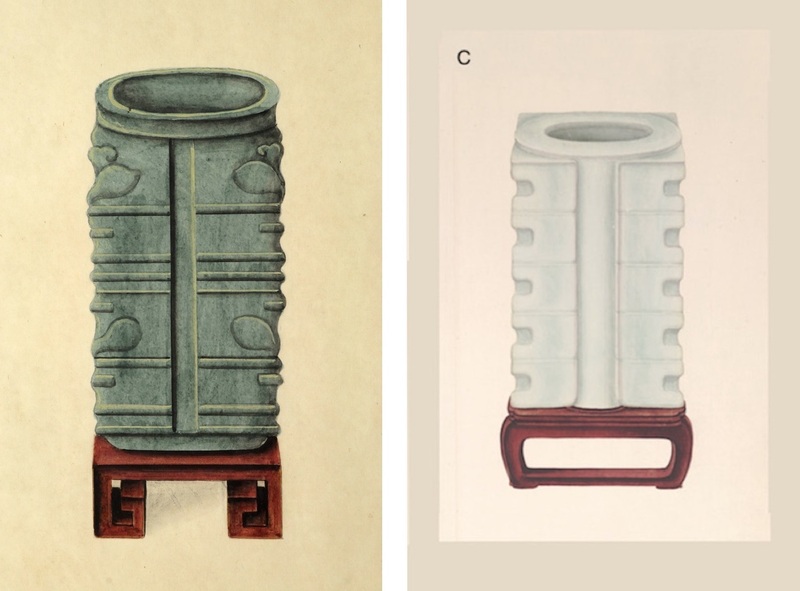 Notably, its 100 drawings depict vases on stands and as such are fundamental to our understanding of the “vases Chinois” across the range of extant albums. LEFT: Fig. 5. Smith-Lesouëf Album. Vase Chinois (covered double-gourd jar), China, c. 1770-1780. Ink and colors on paper, 35.7 x 25.5 cm. 25. Vases Chinois Envoyé par les Mission[naires] A[à] M[onsieur]. Bertin, II, pl. 5. Provenance: William Beckford (1760-1844) and Alexandre-Auguste Lesouëf (1829-1906). Paris, Bibliothèque nationale de France, Département des manuscrits, Smith-Lesouëf CH 103. ©BnF. RIGHT: Fig. 6. Doucet Album. Vase Chinois (covered jar), China, c. 1770-1780. Ink and colors on paper, 35.8 x 24.8 cm. 24. Vases Chinois Envoyé par les Mission[naires] A[à] M[onsieur]. Bertin, pl. 11. Provenance: Jacques Doucet (1837-1907). Paris, Institut national d’histoire de l’art, Fonds Jacques Doucet, Ms. 408. ©INHA. Fig. 7. Cover and Title-Page, France, c. 1770-1780. Quarto album: blue paste-paper. 37 x 36.5 cm. Vases anciens et diverses Porcelaines de Chine. Paris, Bibliothèque nationale de France, Département des Estampes, OE-42-PET FOL. ©BnF. As Bertin’s previously cited correspondence indicates, the majority of the “vases Chinois” were sent from China in groups of one hundred or two hundred sheets and subsequently bound in France into albums of varying dimensions comprising different numbers of drawings. Judging from the scale of one of the albums made in the nineteenth century, the sheets of paper must have originally been at least 47 centimeters in height. 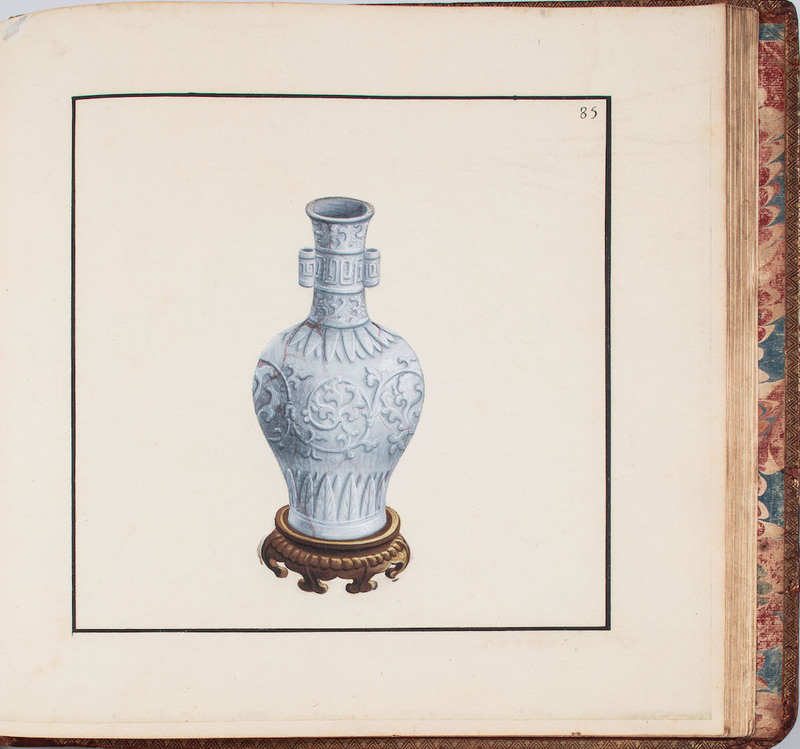 The two extant albums of “vases Chinois” bound in the 1770s to Bertin’s specifications measure 33 to 35 centimeters in height, suggesting that the original sheets were trimmed to suit a quarto format of square or slightly rectangular shape. 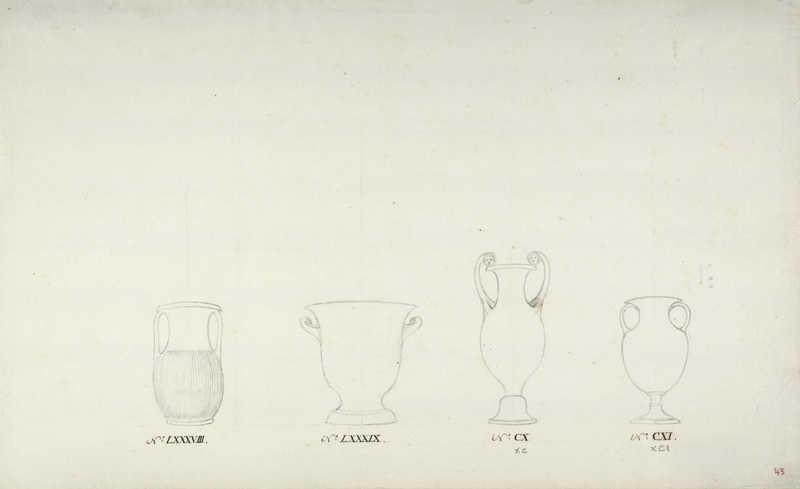 One, now in the Bibliothèque nationale de France (hereafter BnF), is entitled Vases anciens, et diverses Porcelaines de Chine (hereafter “Estampes Album”) and contains 71 drawings which were laced into simple covers of blue paste-paper (Fig. 7). A second, specially commissioned album of 100 drawings, now in a private collection, is a far more luxurious production, entitled “Recueil de Vases Antiques. et Piéces, tirés des Cabinets Chinois de l’Empereur Kien-Long.” (hereafter “Vershbow Album”). Its drawings were bound between covers of brown calfskin tooled in gold with Bertin’s coat of arms of Bertin and “Vases Antiques” on the spine—an abbreviation of the full title inside (Fig. 8). Fig. 8. 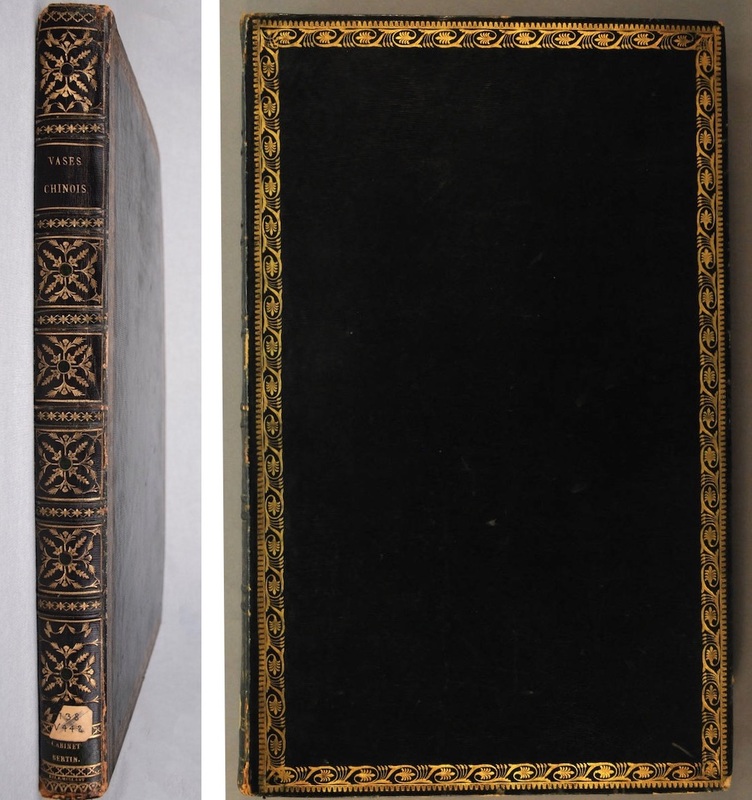 Cover, Spine and Title-Page, France, c. 1770-1780. Quarto album: calfskin leather, gilt with the arms of Henri-Léonard Bertin (1720-1792), 34.3 x 36.8 cm. Recueil de Vases Antiques. et Piéces [sic], tirés des Cabinets Chinois de l’Empereur Kien-Long. Provenance: Arthur Vershbow (1922-2012). Private Collection. Photo: Richard P. Goodbody NYC. These distinct binding strategies correspond to the two extant groups of original albums that survived the French Revolution, most of which are preserved along with other Bertin materials in the BnF. Seven have inexpensive, blue paste-paper covers (hereafter “Paste-paper Group”) while six others, including the Vershbow Album, are identically bound in brown calfskin emblazoned with Bertin’s coat of arms (hereafter “Calfskin Group”). The images found in these groups illustrate a wide range of subjects from architecture, tombs and garden design to costumes, jewelry, horticulture and hot houses, ovens and tea equipage. There is also a rare suite of forty views of the Yuanmingyuan or the Garden of Perfect Clarity, the imperial garden palace located just northwest of Beijing. Irrespective of their subject matter and type of binding, all the extant albums contain annotations in French, Chinese or both languages. If written in French, the inscriptions were added in Europe and the quality of the calligraphy used—intended more or less to mimic printed type—seems commensurate with the overall expense of the specific album. Hence, highly skilled calligraphers were clearly engaged for the texts in the Calfskin Group. Fig. 9. 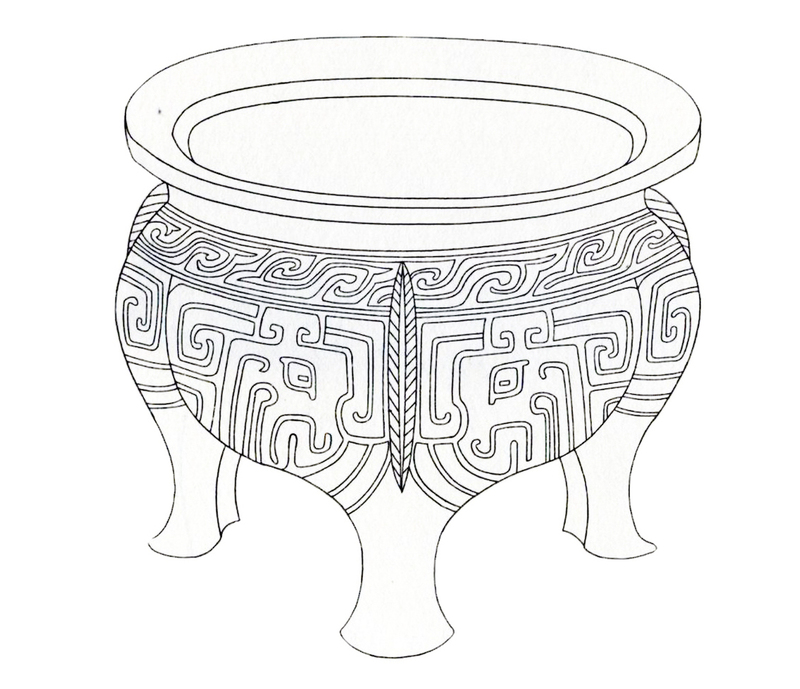 “Vase ancien” (li), Zhou dynasty. Ink and colors on paper, 33.8 x 69 cm. Vershbow Album, pp. 27-28. Photo: Richard P. Goodbody NYC. These two groups of albums also differ from each other in the presentation of their images and inscriptions. With the exception of one album within the Paste-paper Group, a single-page format was used in which the object or objects float in the center of a page framed by a simple black-ruled border (see Fig. 2 and also Fig. 30). 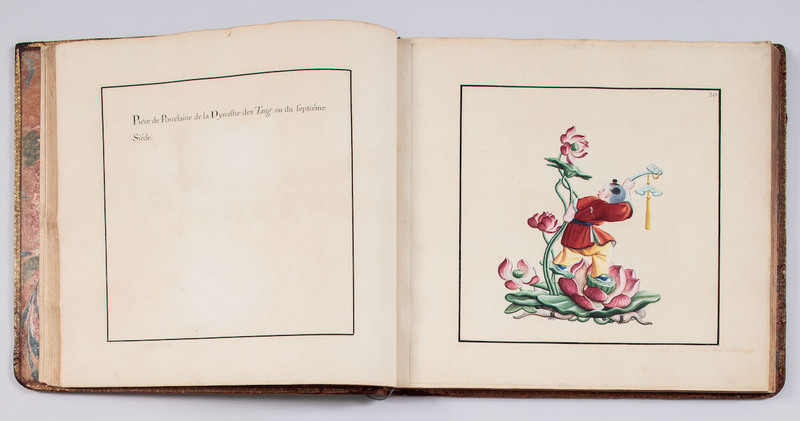 The albums in the Calfskin Group, however, uniformly employ a two-page format in which the vase or subject is centered on the right page facing the annotations or explanatory text on the left, each within simple black or red-ruled borders (see Fig. 9 and also Fig. 13). 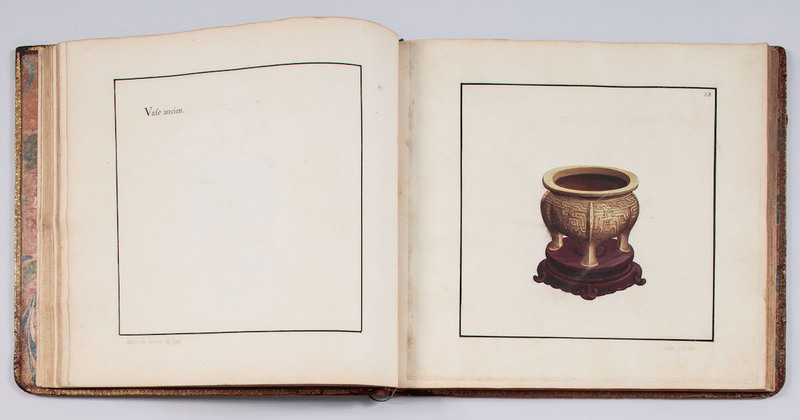 By combining the luxurious calfskin binding with this more consciously didactic two-page layout—notably in the Vershbow Album entitled “Vases Antiques”—Bertin clearly intended to prioritize certain subjects. By the middle of the eighteenth century, the word ancien—as it was used in royal and aristocratic inventories as well as in auction records and documents pertaining to the Sèvres royal porcelain manufactory—indiscriminately connoted China and Japan when applied to the description of porcelains or ceramic models irrespective of their actual age. For example, in the posthumous circa 1724 inventory of Philippe, duc d’Orléans (1640-1701), item 725 was described as “Deux pots pouris de porcelaine bleüe celeste ancienne garnis d’argent, un autre gros pot pouri de porcelaine ancienne de couleurs forme baroque garni de vermeil, 150.” And in the catalogue of the circa 1771 estate sale of the painter François Boucher (1703-1770), lot 772 was “Deux vases d’ancienne porcelaine blanche, découpés en batons rompus, garnis chacun de deux anneaux & feuillages de bronze doré.” Therefore, its apposite use in the title Vases anciens for his Estampes Album would have prompted Bertin and his contemporaries to comprehend the contents as Chinese rather than European. Through a comparative study of the vases represented both in the woodcuts of the Qinding Xiqing gujian and in the corresponding drawings of the “vases Chinois”—one no doubt encouraged by his Jesuit advisors who sent him both—an efficacious awareness of China’s antiquity as exemplified by the myriad forms of ritual bronzes and other objects would gradually emerge. Over time Bertin came to perceive them not only as ancien, but also unscientifically equivalent—if only in terms of their presumed venerability, authenticity and age—to Greco-Roman vases, which at the time were invariably referred to as antique. The Qinding Xiqing gujian, compiled at the behest of the Qianlong emperor between 1749 and 1755, served both as a graphic inventory of the imperial collections of ritual bronzes and as an official manifesto of the emperor’s personal and ideological commitment to China’s ancient past. Its publication was a profoundly political act by which Qianlong laid claim to his own legitimacy as collector-emperor by emulating the virtuous precedent of the Huizong emperor (r. 1101-1125) of the Northern Song dynasty, the first emperor of China to publish his collections. Organized according to the efficacious model of the Huizong emperor’s own catalogue—the Xuanhe bogu tu—the Qinding Xiqing gujian was comprised of forty fascicules in which ritual bronzes were organized by form and then chronologically from the Shang (1600-1046 BCE), Zhou (1046-256 BCE), Han (206 BCE-220 AD) and Tang (618-907 AD) dynasties. Each object was catalogued and illustrated as a linear schema with a brief description of its appearance, dimensions and origins on the recto, together with facsimiles of rubbings of relevant inscriptions on the verso (see Fig. 1 and Fig. 11). Bertin’s evident zeal for the objects illustrated was such that he invoked the key words “antiquité” and “antique” as he instinctively likened them to Greek and Roman vases, the forms of which he had studied in other European antiquarian treatises about which I will have more to say below. Bertin had been tutored by the Jesuits to read the two-page layout of each vase, especially as to where pertinent information was provided, yet at the same time he lamented the fact that no one had yet explained how the vases were used. Fig. 10. Detail of “Vase ancien” (Fig. 9). Fig. 11. Ritual bronze (li), Zhou dynasty. Woodcut. Qinding Xiqing gujian, juan 31, p. 2. Image in the Public Domain. The “vases Chinois” drawings may well have been sent to the minister in response to his desire for more comprehensive information about the vases he had first encountered in the emperor’s bronze catalogue. As ornament drawings in the European sense of this art term, they served to “flesh-out” what the linear woodcuts could only suggest. 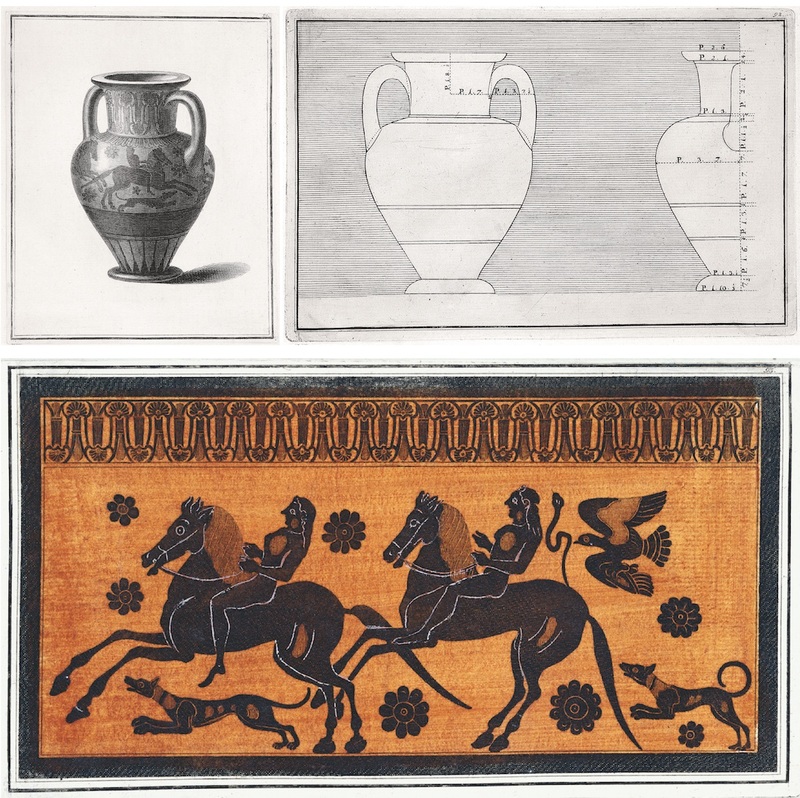 They provided not only fully executed, illusionistic renderings but also annotations frequently attesting to the material, function, and, most importantly, age of the vases depicted. Some thirteen correlations between the drawings from the Estampes Album alone and the woodcuts have been identified thus far, strongly suggesting that the draftsmen were familiar with the Qinding Xiqing gujian catalogue. 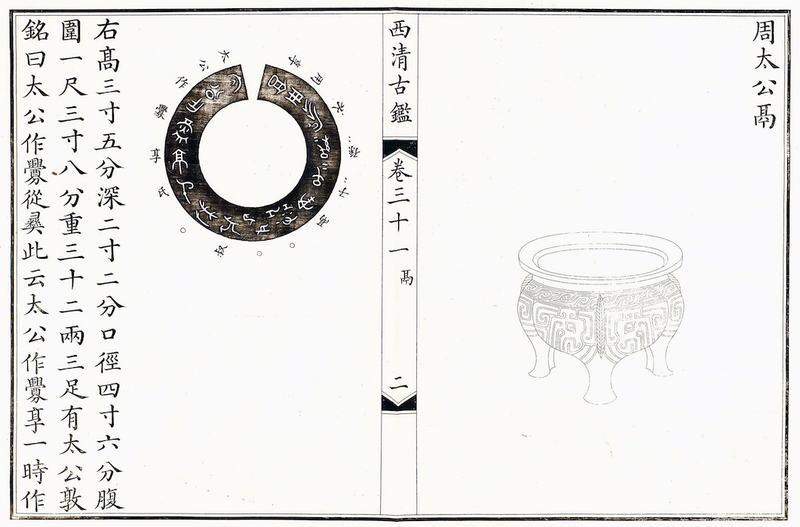 Indeed the Estampes Album included a sampling of ritual bronze forms—you, hu, yan, liding, gu, and pu—dating from the Zhou and Han dynasties (see Fig. 1 and Fig. 2), as the Chinese annotations located in the right corner of the page attest. 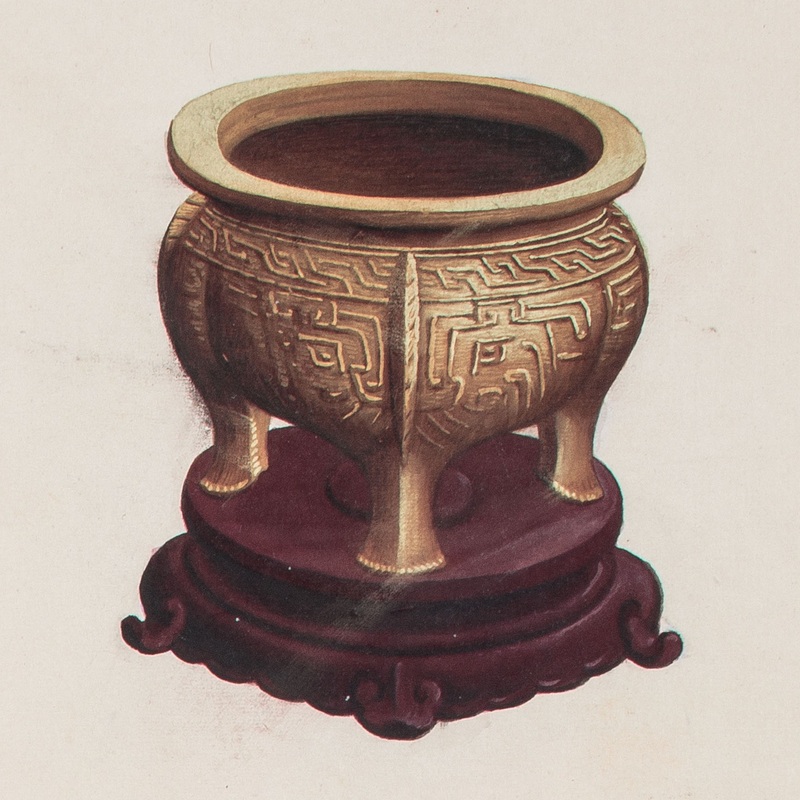 Equally, the Vershbow album presents a bronze tripod censer—a li of the Zhou dynasty—but annotated simply as “vase ancien” (see Fig. 9 and Fig. 11). In addition to the use of the two-page format employed in the Qinding Xiqing gujian, the drawing was unmistakably derived from the woodcut illustrating that bronze (see Fig. 10 and Fig. 12). Fig. 12. Detail of Ritual bronze (li) (Fig. 11). Fig. 13. “Piéce de Porcelaine de la Dynastie des Tang ou du septiéme Siécle.” Ink and colors on paper, 33.8 x 69 cm. Vershbow Album, pp. 19-20. Photo: Richard P. Goodbody NYC. While most of the annotations are similarly brief, they convey what Bertin believed to be authentic, if not at times entirely accurate information, especially with respect to the age of the form depicted. For example, the drawing annotated as “[Une] Piéce de Porcelaine de la Dynastie des Tang ou du septiéme Siécle” shows a small, well dressed boy entwined in a lotus plant (Fig. 13). For Bertin this design could not have represented porcelain, at least not as he and his contemporaries understood that material, unless Amiot or another of the minister’s Jesuit correspondents had encountered at the court Ding wares or porcelaneous stonewares not yet available in the West. At the very least the drawing communicated an arcane piece of Buddhist iconography—a fertility symbol promoting the auspicious advent of healthy, intelligent male progeny, which became a popular decorative motif in the Tang dynasty persisting through the eighteenth century. Notwithstanding the superficial strangeness of this particular drawing (indeed many of the “vases Chinois” appear unorthodox, if not to say strange, to modern connoisseurs), the accompanying annotations underscore both the extraordinary breadth and curious limitations of the information the Jesuits provided. Figs. 14a and 14b. Title-Pages. Engravings, 36.2 x 44.4 cm. Collection of Etruscan, Greek and Roman Antiquities from the Cabinet of the Hon[ourable]. W[illiam]. Hamilton, I, 1766 (Etruscan Antiquities). Images in the Public Domain, reproductions courtesy of Taschen GmbH. 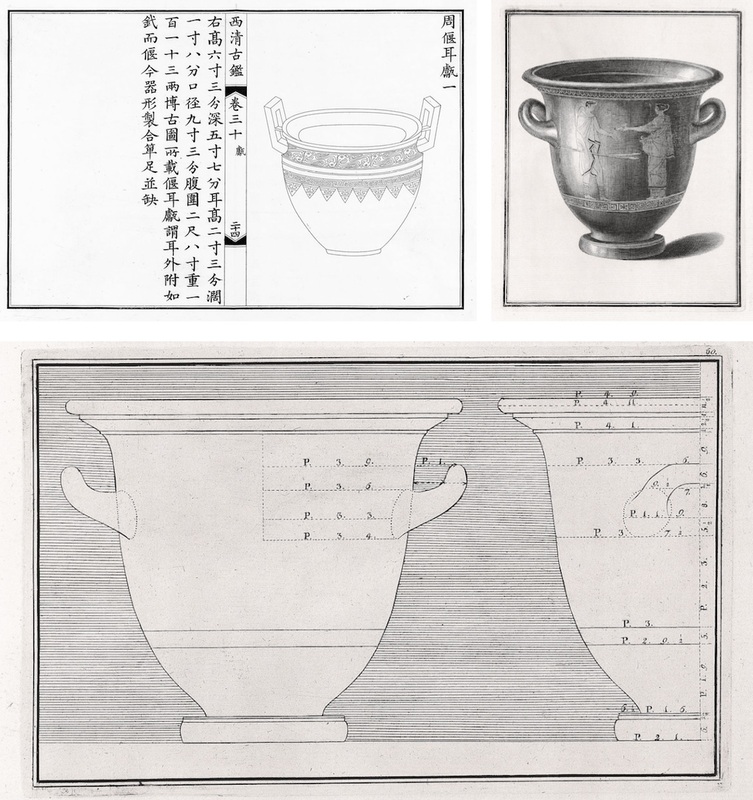 The same letter of 18 January 1774 offers a telltale clue as to Bertin’s intentions for the “gravures ou impressions des vases chinois.” The phrase “leurs recueils” in the above quotation refers, in my view, not to actual ancient assemblages of comparative material, but rather to the contemporary European practice of other antiquarian “recueils,” as exemplified by (among others) [The] Collection of Etruscan, Greek and Roman Antiquities from the Cabinet of the Honourable William Hamilton, published between 1766 and 1776 in both English and French, with the title [Recueil d’]Antiquités Étrusques, Grecques, et Romaines tirées du Cabinet de M[onsieur]. Hamilton (Etruscan Antiquities) (Figs. 14a and 14b). 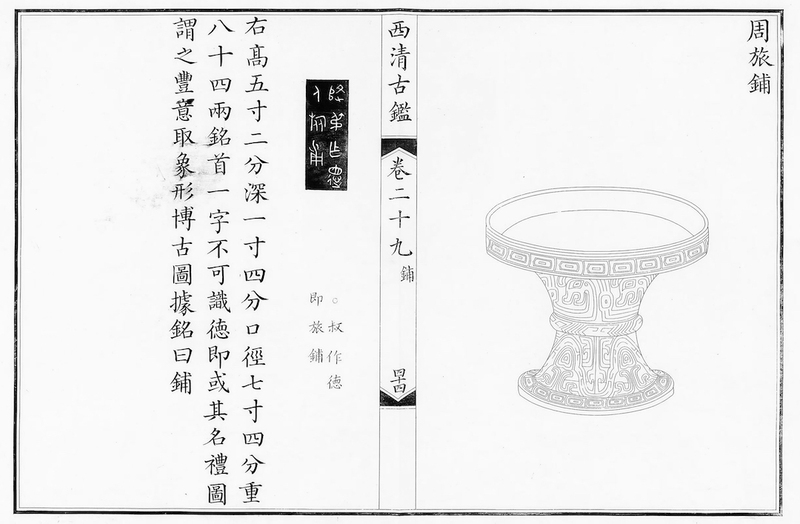 Bertin’s decision to entitle the Vershbow Album “Recueil de Vases Antiques” and to adopt the two-page layout of the emperor’s bronze catalogue may well have been influenced as much by his familiarity with the Etruscan Antiquities as by his careful reading of the Qinding Xiqing gujian and its “fleshed-out” drawings of the same forms among the “vases Chinois.” Both antiquarian works exhibit a shared commitment to the past as revealed through a remarkably similar, graphic typology of ancient vases. Figs. 15a, 15b and 15c. Neck-amphora. Engraving. Etruscan Antiquities, I (1766), pls. 91, 92 & 93. Images in the Public Domain, reproductions courtesy of Taschen GmbH. 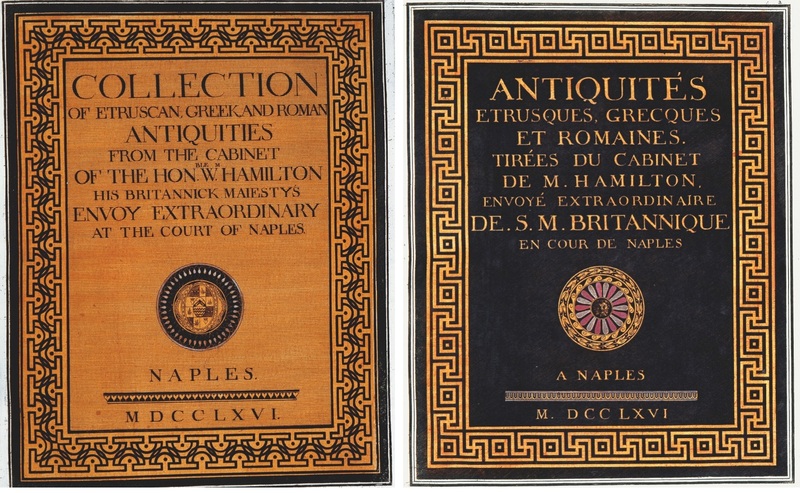 The Etruscan Antiquities was both a catalogue of the renowned collection of antiquities assembled by Sir William Hamilton (1730-1803) as well as a treatise on classical antiquity authored by Pierre d’Hancarville (1719-1805). Equivalent to the mode of presentation employed in the Qinding Xiqing gujian, it presented Attic red figure vases through a didactic combination of monochromatic engravings that lent their forms the illusion of three-dimensionality, while also offering measured diagrams of the same vases in profile and, where appropriate, colored engravings of their friezes formatted as small paintings (Figs. 15a, 15b and 15c). For Bertin, many of the emperor’s bronzes would have resonated with equivalent forms in the Etruscan Antiquities such as the bell-krater and the neck-amphora (Figs. 16a, 16b and 16c). Lastly, the distinctive phrasing adopted for the title of the Vershbow Album confirms Bertin’s debt to such European recueils of antique vases in conceiving the visual taxonomy of his own (see Fig. 8 and Figs. 14a and 14b). Just as the authority of the Etruscan Antiquities had been vested in Sir William Hamilton as the leading antiquarian-collector in Europe at the time, the authority of Bertin’s Recueil de Vases Antiques could only have been vested in the Qianlong emperor, whom the minister had come to recognize as both the possessor and protector of China’s antiquity. Figs. 16a, 16b and 16c. Ritual bronze (yan). Woodcut. Qinding Xiqing gujian, juan 30, p. 154. Image in the Public Domain. Bell-krater. Engraving. Etruscan Antiquities, II (1767), pls. 59 & 60. Images in the Public Domain, reproductions courtesy of Taschen GmbH. Figs. 17a and 17b. Anonymous Qing court artists, Guwan tu (Pictures of Ancient Playthings): two details from scroll #6, China, dated 1728. A handscroll from a series, ink and color on paper, 62.5 x 1502 cm. Percival David Foundation of Chinese Art, PDF X0I. ©The Trustees of the British Museum. CC BY-NC-SA 4.0. Fig. 18. Detail of Fig. 17a. Vase, porcelain with under glaze blue, Xuande mark and period (1426-1435). Fig. 19. Vase on wooden stand. Ink and watercolors on paper, 24.8 x 24.9 cm. Vershbow Album, p. 85. Photo: Richard P. Goodbody NYC. LEFT: Fig. 20. Conjoined fish on carved wood stand. Ink and colors on paper, 44.5 x 27.9 cm. Oberlin Album, pl. 18. No known copyright. RIGHT: Fig. 21. Three Fish-shaped Vases. Porcelain: celadon glaze with incised decoration, China, Qianlong period (1736-1795). Mounts: chased, gilt-bronze, France, c. 1750-1755, H (left, right & center): 33 cm. Museu Calouste Gulbenkian, inv. 124/A/B/C. Photo courtesy of the Museu Calouste Gulbenkian. Within the studied randomness that in a sense also characterizes the “vases Chinois,” there are many drawings of ceramic forms representing the new motifs and palettes that had been exported to the West in the mid-eighteenth century and were thus familiar to connoisseurs like Bertin. They include the especially popular model of conjoined carp, here depicted on a wooden stand appropriately carved with foaming waves (Fig. 20). 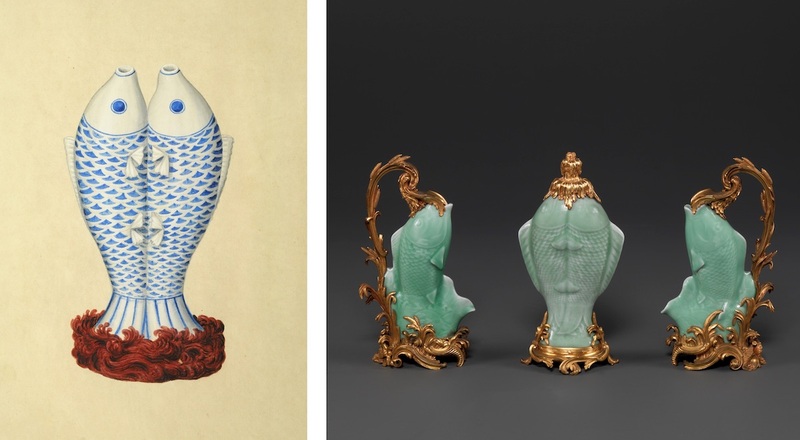 Leaping carp had been a recurrent theme in both Japanese and Chinese export porcelain since the late seventeenth century and were available in single- and double-fish variants, both of which were frequently mounted in silver or gilt bronze (Fig. 21). They were typically made with bases sufficiently wide for the form to stand independently. But at least one variant displays a narrower foot sculpted with waves in relief, suggesting that it was consciously made to be mounted. Fig. 22. Anonymous (French), Depictions of a Japanese Bowl & Cover (XI) and a Chinese Wine Cooler (XII), c. 1770-1785. Pen and brown ink with watercolor on paper, 37.8 x 23.3 cm. Gift of Ralph Esmerian, 1961, inv. 61.680.1(6). ©The Metropolitan Museum of Art, New York. Fig. 23. Anonymous (French), Depictions of Four Silhouettes of ‘Etruscan’ Vases, c. 1770-1785. Black chalk, and pen and brown ink on paper, 37.7 x 23.3 cm. Gift of Ralph Esmerian, 1961, inv. 61.681.1(30). ©The Metropolitan Museum of Art, New York. Fig. 24. Detail of Fig. 23. No. LXXXVIII (88), A ribbed, black-glazed pelike. An intriguing analog for both the “vases Chinois” and the Guwan tu scrolls is located in a suite of European ornament drawings of vases that has long been associated with Albert Casimir, prince of Saxony, duke of Sachsen-Teschen (1738-1822), and his wife Marie Christine (1742-1798). Similarly dated to 1770-1785, it is comprised of thirty sheets of paper, twenty-nine of which are uniformly sized and horizontal in format. Across the running length of these sheets, 91 distinct vases are depicted in a single row (except for the forms on the penultimate sheet), listed in roman numerical order, annotated in French, and similarly set against the unadorned void of the paper (Figs. 22 and 23). Said to have emanated from the Parisian marchand mercier Simon-Philippe Poirier (1720-1785), the suite, like the Guwan tu scrolls, was seemingly intended to serve as a pictorial inventory either of his stock or of the collection in the Palace of Laeken in Brussels that was built for the Sachsen-Teschens during their tenure as governors of the Austrian Netherlands during the 1780s. Many of the sheets evoke then current European notions of elite display as exemplified by the massing of forms into garnitures, while many of the individual vases are embellished with gilt-bronze mounts in Régence, rococo and neoclassical tastes. This discrete group is also analogous because its drawings could easily have formed thirty now fragmented sections of the same lengthy handscroll or as many discrete pages that were never interleaved and bound into a dedicated recueil. And within the scope of the vases selected, the suite presents a comprehensive historicist selection of ceramic palettes, forms and types found throughout Europe at the time, one that might easily have been titled “Recueil de Vases—anciens, nouveaux et antiques.” Indeed, the suite illustrates ceramics from China and Japan which (as we have noted) were described at the time as “ancien,” “porcelaine de Seve (Sèvres)” and “porcelaine de Saxe (i.e., Meissen)”—both of contemporary European manufacture—as well as “Diff[é]rentes Pi[è]ces de Potterie [É]trusque” or Greek vases. So assembled, the vases date broadly from classical antiquity up to the 1780s. And most critically the drawings were rendered, like the “vases Chinois,” either as fully realized colored ornament or, after the practice evidenced in both the Etruscan Antiquities and the Qinding Xiqing gujian, as profiles in outline (Fig. 24). Sir Francis Watson inaccurately characterized this abstract mode of depiction as unfinished, a notion that failed to account for the descriptive practice as widely disseminated through the publication of the Etruscan Antiquities and thus clearly exemplified by drawing no. LXXXVIII (88) depicting a ribbed, black-glazed pelike (Figs. 25a and 25b). Figs. 25a and 25b. A ribbed, black-glazed pelike. Engraving. Etruscan Antiquities, I (1766), pls. 97 & 98. Images in the Public Domain; reproductions courtesy of Taschen GmbH. Figs. 26a and 26b. René Othon Meslant (1769-1840), Spine and Cover of “Vases Chinois,” France, c. 1820. Violet morocco and gold tooling, 45.7 x 29.5 cm. Provenance: William Beckford (1760-1844) and Mary A. Ainsworth (1867-1950), Oberlin College, Class of 1889. Oberlin College, Clarence Ward Art Library, Shelf mark NK4655 V38. No known copyright. At this time, 174 of Henri Bertin’s drawings of the “vases Chinois” filtered through the Paris art market, most likely as simply sewn sheets or bound inexpensively. Around 1820, they were gathered into luxurious albums imitating the elite practice that, as we have seen, Bertin himself had applied. Three groups totaling 74 drawings—one of 24 sheets, the other two of 25 each—were laced into covers of citron morocco leather tooled in gold with the title 24. [or] 25. Vases Chinois Envoyé par les Mission[naires] A[à] M[onsieur]. Bertin. François-Louis Serre, a Parisian bookseller and binder active in the period of the Bourbon restoration, signed these bindings. René Othon Meslant (1769-1840) bound the other 100 sheets between covers of violet morocco leather similarly tooled in gold with the title Vases Chinois and the legend “Cabinet Bertin” (Figs. 26a and 26b). The paper edges of all four volumes were also gilded, a typical enrichment of elite bindings, in a restrained style purported to have appealed to the English bibliophile, collector and novelist William Beckford, who indeed acquired both the double-volume album of 50 bound by Serre and the single album of 100 drawings bound by Meslant, most likely through his Paris agent Antoine-Augustin Renouard (1765-1853). In 1882, these Beckford-Bertin albums were sold in London at the Hamilton Palace auction of the Beckford library to the prominent bookseller Bernard Quaritch (1819-1899), who promptly featured them in his General Catalogue of 1883. They were subsequently re-offered in Paris at the Hôtel Drouot in 1892. The double-volume album was then acquired by the renowned French bibliophile Alexandre-Auguste Lesouëf (1829-1906) and eventually bequeathed as part of his extensive library to the BnF in 1913 (hereafter “Smith-Lesouëf Album;” see Fig. 5). As introduced earlier, the single album of 100 sheets was eventually bequeathed to Oberlin College (Oberlin Album). Lastly, the single album of 24 drawings, also bound by François-Louis Serre but not acquired by Beckford, was first owned by the bibliophile and composer Alfred Werlé (1837-1907) and then by the couturier and collector Jacques Doucet (1853-1929; hereafter “Doucet Album;” see Fig. 6). Fig. 27. James Aldridge (FL. 1788-1822), Vase. Porcelain: hard-paste, enamels, China, Qianlong period; Mounts: silver gilt, England c.1815-1820, H: 23cm. ©National Trust for Scotland, Brodick Castle, inv. 58.4219.1. LEFT: Fig. 28. Cong (jade?) on wood stand. Ink and colors on paper, 44.5 x 27.9 cm. Oberlin Album, pl. 68. No known copyright. RIGHT: Fig. 29. Detail of Fig. 17. Cong (celadon or guan ware), Song dynasty (960-1279). Objects garnished with gold, silver and silver-gilt represent an area of Beckford’s collection in which the Bertin drawings directly meshed with his interest in ornament and display. The Oberlin Album in particular would have struck Beckford and the artisans he engaged as a compendium not only of authentic vases, largely ceramic models, but also of the stands made expressly for them in a variety of materials (carved, turned or silk-covered wood, carved and painted ivory, and gilt black lacquer). The specific mode of depiction employed in these drawings, of which bespoke stands were a defining feature, was exemplary of Qing imperial practices. As emphasized earlier, the Oberlin, Estampes and Vershbow Albums offer numerous apposite comparisons of style, form and object type with similar works of art depicted in the emperor’s scrolls of antiquities (Figs. 28 and 29; 30 and 31). In addition, they all present myriad vases on bespoke stands. As such, they exemplify long established Chinese display practice that was equivalent to—and perhaps even influenced—European designs for attached gilt-metal mounts. LEFT: Fig. 30. Brush-washer (?) on a painted ivory stand. Ink and colors on paper, 36.5 x 27.9 cm. Estampes Album, pl. 57. ©BnF. RIGHT: Fig. 31. Detail of Fig. 17. Brush-washer, porcelain (? ), Yongzheng period (1723-1735). Fig. 32. Teapot on Stand. Sèvres Factory. Porcelain: hard-paste, France, c.1780, Mounts: silver and silver gilt, England, c. 1815-1820, H: 14.5 cm. ©National Trust for Scotland, Brodick Castle, inv. 58.4222. William Beckford’s lifelong interest in display, especially with respect to stands, was widely recognized through prints and lithographs of his collection that were published in 1823 and following his death in 1844, the latter of which were originally based upon a suite of three oil paintings by Willes Maddox (1813-1853). In Objects of Vertu I a Chinese white jade vase is prominently displayed on a carved, hardwood stand amidst a diverse array of other prized objects, one of which is a chocolate-brown porcelain teapot perched on a silver-gilt stand (Fig. 32). We now know it to have been made at Sèvres after a dehua model, but given the care Beckford invested in the design of the stand he may well have perceived the teapot to be Chinese. Consistent with what he discerned in his other Chinese objects, he commissioned an artisan to fashion an open-work stand on which, after the Chinese practice, the teapot was meant to be set. The stand was closely tailored to suit the pot’s lobed perimeter in much the same way that a vase of an analogous, sinuous plan depicted in an Oberlin drawing was fitted with a comparable open-work base in wood (Fig. 33). It too is comprised of a lobed rim set above a curved, shaped apron joined to a circular stretcher by scrolled legs. The complex construction and delicate appearance of this specialized type of stand differentiate it from other mounts that Beckford commissioned, especially those designed by James Aldridge (b. 1768). These were typically fashioned as broad, often splayed bands of metal, the architectonic profiles of which generally lent Beckford’s other garnished wares their distinctive character (see Fig. 27). Eleven other drawings in the Oberlin Album show vases with similar openwork stands. Throughout his collecting career, Beckford had repeatedly proved sensitive to the unique characteristics of the objects he embellished and thus always attentive to authentic display practices. In this respect, the ornament drawings of “vases Chinois” had furnished an invaluable design resource, not only potentially to Henri Bertin, but also demonstrably to William Beckford, because they resonated broadly with historic Qing and European notions of display and ornament. Fig. 33. A lobed vase on a wood, open-work stand. Ink and colors on paper, 44.5 x 27.9 cm. Oberlin Album, pl. 26. No known copyright. Translations are by the author unless otherwise noted. The original French spelling has been retained for all titles and quotes. Fundamental art historical contributions to our emerging understanding of Henri Bertin’s achievement include not only the work of Kristel Smentek and John Finlay as cited below, but also two publications that have introduced the subject to a wider audience: see Marie-Laure de Rochebrune, ed., La Chine à Versailles: art et diplomatie au XVIIIe siècle (Paris: Somogy, 2014); and Chao-Ying Lee, Visions de l’empire du milieu au 18e siècle en France: illustrations des Mémoires concernant les Chinois 1776-1791 (Louvain-la-Neuve: Accademia-l’Harmattan, 2016). Henri Cordier, “Les correspondants de Bertin, Secrétaire d’État au XVIIIe siècle,” Toung Pao 14:2 (1913), 227-257. “M[onsieur]. Bertin is pleased not only to let us see this collection, but even to communicate the different objects to both savants and artists who hope to derive some useful value from their examination.” Luc-Vincent Thiéry, Guide des amateurs et des étrangers voyageurs à Paris (Paris: Hardouin et Gattey, 1787), 136. Monique Cohen and Nathalie Monnet, Impressions de Chine (Paris: Bibliothèque Nationale, 1992), 141, cat. no. 86; and Liang Shizheng (1697-1763), Xi qing gu jian shu (Beijing Shi: Beijing gong yi mei shu chu ban she, 2011(facsimile, 9 vols)). “twenty-four drawings of vases;” “renderings of Chinese vases;” [a] collection of Chinese vases, of different forms: two-hundred and two sheets; and “some one-hundred Chinese vases.” Henri Bernard, “Catalogue des objets envoyés de Chine par les missionnaires de 1765 [à] 1786,” Bulletin de l’Université l’Aurore 9 (1948), 135 (c.1770), 151 (c.1776), 166 (c.1778), 177 (c.1779). 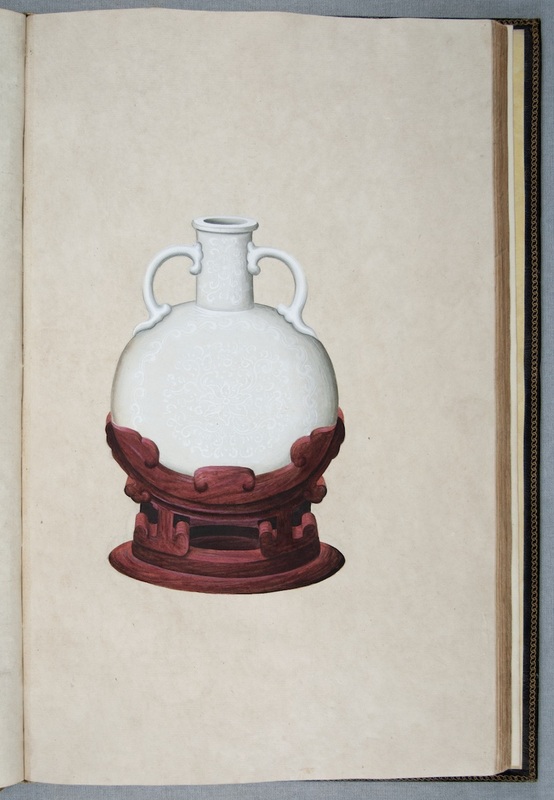 I am grateful to Dr. Laurent Châtel of the University of Lille for alerting me to the 1882 sale of the Beckford albums of the “vases Chinois,” and to Dr. Nathalie Monnet of the Bibliothèque nationale de France for locating one of them in the Département des manuscrits (see below). Constance Bienamé, “Bertin’s Chinese collection: From Curiosity to Knowledge,” in Susan Bracken, Andrea M. Gáldy and Adriana Turpin, eds., Collecting East and West (Newcastle-upon-Tyne: Cambridge Scholars Publishing, 2013), 137-146. Michel Hermans, “Joseph-Marie Amiot: une figure de la rencontre de ‘l’autre’ au temps des lumières,” in Yves Lenoir and Nicholas Standaert, eds., Les danses rituelles Chinoises d’après Joseph-Marie Amiot (Namur: Éditions Lessius, 2005), 11-77. Nathalie Monnet, Chine: l’Empire du trait: calligraphies et dessins du Ve au XIXe siècle (Paris: Bibliothèque nationale de France, 2004), 105-107; 188-191; and Kee Il Choi Jr., “Father Amiot’s Cup: A Qing Imperial Porcelain Sent to the Court of Louis XV,” in Anne Gerritsen and Giorgio Riello, eds., Writing Material Culture History (London: Bloomsbury, 2015), 33-41. The dimensions of the Oberlin Album are listed in Fig. 26. Sale cat. The Collection of Arthur & Charlotte Vershbow (New York: Christie’s, 9 April 2013), 132-133, lot. 60. Henri Cordier, “Catalogue des albums Chinois et des ouvrages relatifs à la Chine conservés au Cabinet des Estampes de la Bibliothèque nationale,” Journal Asiatique (September-October 1909), 209-262; see Serres chaudes des Chinois et fleurs qu’ils y conservent, EST OE-30-FOL for a comparable example from the Paste-paper Group; and Recueil Historique de Principaux Traits de la Vie des Empereurs Chinois, EST OE-5 (A) FOL for an example from the Calfskin Group. John Finlay, “Henri Bertin and the Commerce in Images between France and China in the Late Eighteenth Century,” in Petra Chu, ed., Qing Encounters: Artistic Exchanges between China and the West (Los Angeles: Getty Research Institute, 2015), 79-94. Stéphane Castellucio, Le goût pour les porcelaines de Chine and du Japon à Paris aux XVIIe – XVIIIe siècles (Saint-Rémy-en-l’Eau: Hayot, 2013), 208-209. “Two potpourris of turquoise Chinese porcelain mounted in silver, another large potpourri of Chinese porcelain baroque in form mounted in silver-gilt, 150 (my italics).” John Whitehead, “Porcelains in the Inventory of the Regent,” The French Porcelain Society Journal I (2003), 29. “Two vases of white Chinese porcelain, carved here and there, each of which is mounted with two rings and leaves in gilt bronze…” Sale cat. (Lugt 1895) Catalogue raisonné des Tableaux, Dessins, Estampes, Bronzes, Terres cuites, Lacques, Porcelaines de différentes sortes, montées et non-montées’…, du Feu M[onsieur]. Boucher, Premier Peintre du Roi (Paris: Chez Musier, 1771), 109, lot 772, my italics. Huichun Yu, “The Intersection of Past and Present: The Qianlong Emperor and his Ancient Bronzes” (PhD Dissertation, Princeton University, 2007), 38-47. Thomas Lawton, “An Imperial Legacy Revisited: Bronze Vessels from the Qing Palace Collection,” Asian Art I:1 (1987-1988), 51-79; Tianlong Jiao, “Exceptional Emperors: The Antiquities Collections of Huizong and Qianlong,” in Emperors’ Treasures: Chinese Art from the National Palace Museum, Taipei, exhib. cat. (San Francisco, Asian Art Museum, 2016), 11-17; and Tao Yan, Mirroring China’s Past: Emperors, Scholars, and Their Bronzes, exhib. cat. (Chicago: The Art Institute of Chicago, 2018) 127-143. “…these are four magnificent volumes which contain the engravings or prints of Chinese vases of the greatest antiquity, the receipt of which I acknowledged in my last dispatch no. 11. Indicating to you what I thought of this fine work in which one sees the most beautiful forms of vases that the Greeks and the Romans would not have disdained to have in their own collections or better yet compared with their own. I regretted in my letter the lack of someone to explain the uses to which these antique vases were dedicated, on the outlines, the details of which would seem to be written next to the designs.” Bibliothèque de l’Institut de France, 18 January 1774, Ms. 1522 (VIII), fol. 57 recto/verso, my italics. 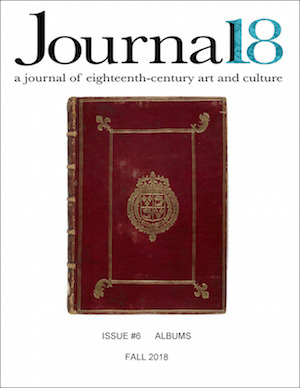 Kristel Smentek, “China and Greco-Roman Antiquity: Overture to a Study of the Vase in Eighteenth-Century France,” Journal18, issue 1 (Spring 2016), http://www.journal18.org/497. Peter Fuhring, Design Into Art: Drawings for Architecture and Ornament: The Lodewijk Houthakker Collection (London: Philip Wilson, 1989), 18, suggests that such a combination of outline and finished drawings was traditionally employed to illustrate inventories of objects. Ann B. Wicks and Ellen B. Avril, eds., Children in Chinese art (Honolulu: University of Hawaii Press, 2002), 6-13; Pierre Uldry, Chinesisches gold und silber: die sammlung Pierre Uldry (Zurich, Museum Rietberg, 1994), 234-235, cat. no. 281; and He Li, Chinese ceramics: a new comprehensive survey from the Asian Art Museum of San Francisco (New York, Rizzoli, 1996), 148 (illustration) and 186, cat. no. 218. Pierre Hugues d’Hancarville, The Complete Collection of Antiquities from the Collection of Sir William Hamilton (Köln, Taschen, 2004 (facsimile). I am grateful to Dr. Petra Lamers-Schütze, managing director of Taschen GmbH for generously furnishing images of plates from the Etruscan Antiquities for this article. See D’Hancarville, Hamilton, 200-201, for the Attic neck-amphora illustrated in the Etruscan Antiquities, vol. I (1766), pls. 46 and 47; and Xiqing gujian, juan 4, 250, for the ritual bronze (hu) of the Zhou dynasty. Notwithstanding evidence of what may have been the hands of different calligraphers within the title (perceptively noticed by a peer reviewer), its phrasing is not only consistent with that of the French edition of the Etruscan Antiquities, but also, as John Finlay observed in an email dated 4 July 2018, grammatically correct. I was also able to reconfirm this when I reexamined the title-page in August 2018. Shane McCausland, “The Emperor’s Old Toys: Rethinking the Yongzheng (1723-35) Scroll of Antiquities in the Percival David Foundation,” Transactions of the Oriental Ceramic Society 66 (2001-2002), 65-75; and China: The Three Emperors, 1662-1795, exhib. cat. (London, Royal Academy of Arts, 2005), 252-255, 430, cat. nos. 168 & 169, for illustrations of the scrolls in the British Museum and the Victoria & Albert Museum. McCausland, Transactions, 68 and n. 7. Suzanne G. Valenstein, The Herzman Collection of Chinese Ceramics (New York: Stanley Herzman, 1992), 72, cat. no. 67 for an example of the Xuande vase now in the Metropolitan Museum of Art (1991.253.41); and Oberlin Album, pl. 90, for the second drawing of a vase which resonates with the Xuande original in the Guwan tu. Zhejiang Sheng bo wu guan, Treasures of Imperial Porcelain: Official Kiln Porcelain of the Qing Dynasty (Beijing: Wen wu chu ban she, 2011), 104-105, for a Qianlong edition that differs markedly from the Ming original. John Ayers et al., Porcelain for Palaces: The Fashion for Japan in Europe 1650-1750 (London: Oriental Ceramic Society, 1990), 164, cat. no. 141; 189, cat. nos. 178 & 179. Yuhua Li, ed, Kangxi, Yongzheng, Qianlong – Qing Porcelain from the Palace Museum Collection (Xianggang: Liang mu chu ban she: Zi jin cheng chu ban she, 1989), 31, cat. no. 141. John Ayers, Chinese and Japanese Works of Art in the Collection of Her Majesty The Queen, II (London: Royal Collections Trust, 2016), 473-474, cat. nos. 1234 & 1235. 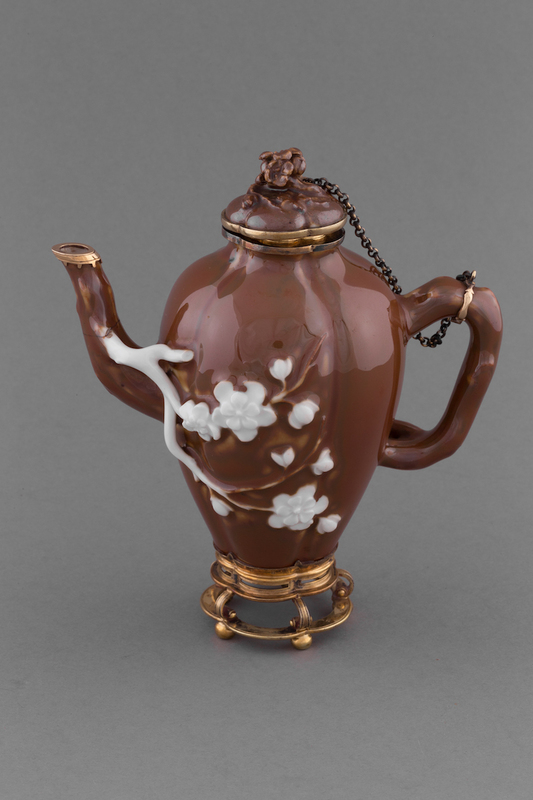 Francis Watson, Mounted Oriental Porcelain (Washington, D.C.: International Exhibitions Foundation, 1986), 126-127. Carolyn Sargentson, Merchants and Luxury Markets: The Marchands Merciers of Eighteenth-Century Paris (London: Victoria & Albert Museum, 1996), 57-58, who quite rightly declared the suite worthy of comprehensive research, a project that I have also undertaken. 1789, le patrimoine libéré: 200 trésors entrés à la Bibliothèque nationale de 1789 à 1799, exhib. cat. (Paris: Bibliothèque nationale, 1989), 255-258. Sale cat. Notices des articles curieux composant le cabinet chinois de feu M[onsieur]. Bertin, ministre et secrétaire d’État sous Louis XV et Louis XVI (Paris: Crapelet, 1815). 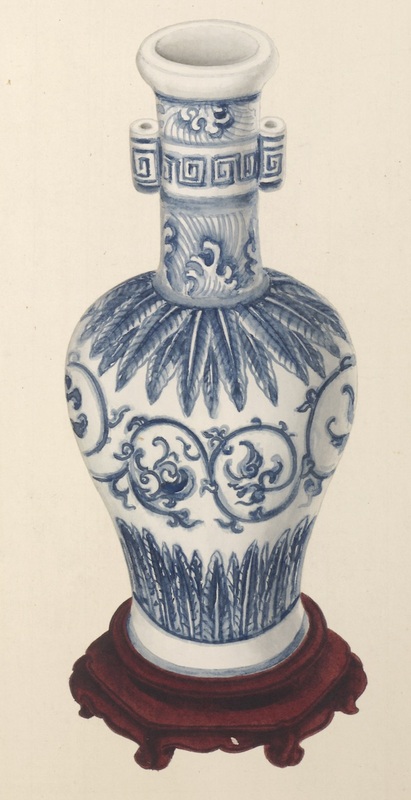 “I have found in the collection of the minister Bertin, drawings of porcelain vases of the most agreeable form, and which, if imitated at the manufacture of Sèv[r]es, would not only lead to advantageous sales, but would become very fashionable.” Jean-Baptiste Breton de la Martinière, La Chine en miniature, IV (Paris: Nepveu, 1811), 113. Paul Culot, Le décor néo-classique des reliures françaises au temps du Directoire, du Consulat et de l’Empire: dictionnaire de relieurs ayant exercé en France c. 1790-1820 (Brussels: Bibliotheca Witttockiana, 2015), 167-168. Anthony Hobson, “William Beckford’s Library,” The Connoisseur 191:770 (April 1976), 298-305. Sale cat. The Hamilton Palace Libraries–The First Portion of the Beckford Library Removed from Hamilton Palace (London: Sotheby, Wilkinson & Hodge, June 30 1882), lots 1904 and 1905; and Bernard Quaritch, Catalogue of Works of Fine Arts, the Galleries,…, Illustrating the History of the Art of Bookbinding from the IXth to the XIXth Century (London, 1883), 1073, nos. 11531 and 11532; and Laurent Châtel, William Beckford: The Elusive Orientalist (Oxford, U.K.: Voltaire Foundation, 2016), 37-42, who discusses the Bertin-Beckford provenance and illustrates three of the “vases Chinois:” figs. 2a and 2b from the Oberlin Album; and fig. 2c from the Smith-Lesouëf Album. Sale cat. (Lugt 50531) Catalogue de Livres Précieux manuscrits et imprimés anciens et modernes (Paris: ÉM. Paul, L. Huard et Guillemin, 27 February 1892), lots 17 and 18. Bequest of Mary A. Ainsworth (1867-1950), Class of 1889, to Oberlin College in 1950. Sale cat. Catalogue de la Bibliothèque de Feu M[onsieur]. Le Comte A[lfred] W[erlé], deuxième partie, livres anciens, manuscrits et imprimés, livres illustrés du XVIIIe siècle (Paris: Librarie Henri LeClerc, 3 February 1908), lot 365. Bet Macleod, “A Celebrated Collector,” in Derek Ostergard, ed., William Beckford, 1760-1844: An Eye for the Magnificent (New Haven: Yale University Press, 2001), 155-175. Gülru Necipoğlu and Alina Payne, eds., Histories of Ornament: from Global to Local (Princeton, N.J.: Princeton University Press, 2016), for a sampling of intriguing contemporary scholarship on ornament and its meaning. Michael Snodin, “William Beckford and Metalwork,” in Ostergard, William Beckford, 203-215. Jan Stuart, “Practices of Display: The Significance of Stands for Chinese Art Objects,” in Jerome Silbergeld et al., eds., Bridges to Heaven: Essays on East Asian Art in Honor of Professor Wen C. Fong, I (Princeton, N.J.: Princeton University Press, 2011), 695-712; and Kristel Smentek, “Global Circulations, Local Transformations: Objects and Cultural Encounter in the Eighteenth Century,” in Chu, Qing Encounters, 43-57, especially fig. 7, an illustration of pl. 71 from the Estampes Album. Ostergard, William Beckford, 156, fig. 9-2; and 408-410, cat. nos. 155-157. Ostergard, William Beckford, 343-344, cat. no. 63; and Aileen Dawson, A Catalogue of French Porcelain in the British Museum (London, British Museum Press, 1994), 146-147, cat. no. 123. Ostergard, William Beckford, 323-324, cat. nos. 37 and 38; 347-348, cat. no. 69; 387-388, cat. nos. 126 and 127. A more expansive treatment of the subject will form a chapter in my forthcoming PhD dissertation in the history of art undertaken at the Centre for Arts in Society, Leiden University. This phrase is taken from the original Call for Papers for this issue of Journal18. Kee Il Choi Jr., “Portraits of Virtue: Henri-Léonard Bertin, Joseph Amiot and the ‘Great Man’ of China,” Transactions of the Oriental Ceramic Society 80 (2015-2016), 49-65. Lawton, An Imperial Legacy, 53.